will re-air Friday Night on ABC! Enjoy the Fall Colors and the end of October! Charlie Brown vs Shrek Premiere... Tonight !!! This is scary!!! ABC & NBC scheduled both cartoons at the very same time! I'm afraid poor Charlie Brown will "get the shaft" (as the little girl says in National Lampoons Christmas Vacation) - since Shrek is brand new. I know at our house, though, Charlie Brown will rule! How about yours??? The Charlie Brown hour will also include - "You're Not Elected, Charlie Brown". Hope some of you can watch one and tape the other. New Christmas Movies & Cartoons released Today on DVD! Holiday Programming on HGTV - Christmas 2010! HGTV experts Sabrina Soto, John Gidding, Kim Myles, Lauren Lake and Angelo Surmelis, along with other design experts, countdown the top holiday d�cor hits and misses for anyone looking to add the spirit of the season to their home. Viewers will learn how to avoid decorating blunders and see inspiring and stylish decorating solutions that can transform any home for the holidays. Designer Genevieve Gorder will help the Jimenez family's holiday wish come true when she transforms their first home into the ultimate space. With a holiday celebration for 25 family and friends in their new home just around the corner, Genevieve will transform the home's kitchen, dining room and living room, topping off her design plan with some holiday sparkle. In addition, Genevieve must also prepare her own home for the holidays. During each one hour special, three neighboring families will compete to create the best holiday home on the block. Host Kim Myles will give each team $5,000 - and her best design advice - to help them construct spectacular holiday displays. With construction help from HGTV's Scott McGillivray, the families will strive to impress the judges and wow the neighbors. Viewers will get a glimpse inside the homes of Dancing with the Stars co-host Brooke Burke, The View's Sherri Shepherd and country music superstar Trisha Yearwood, as HGTV decorates their homes for the holidays. Whether it's a country Christmas or a California-inspired theme, viewers will receive incredible holiday decor ideas and decorating tips from designers Brandon Branch, Mike Russo and Sandra Espinet. Janice and Craig bought a small bungalow with visions of transforming it into the home of their dreams. But when their contractor left abruptly, the family of six had no choice but to live in the basement of their incomplete home. With Christmas just around the corner, the homeowners hope that contractor Mike Holmes and his team can transform the inadequate living space into a finished home in time for the holidays. During this one-hour special, designer Sarah Richardson will show viewers her time-tested methods for hosting a grand holiday party for family and friends. Sarah and her design assistant, Tommy, will demonstrate every detail - from planning and decorating to cooking and gift giving - as they pull together a memorable holiday soiree. With just four weeks to spare, designer Sarah Richardson will help a couple overcome the design dilemmas of a tight budget and differing style preferences. In the end, she creates the perfect layout for the homeowners' jubilee cocktail party. Visit the Christmas Schedule to see these and more! 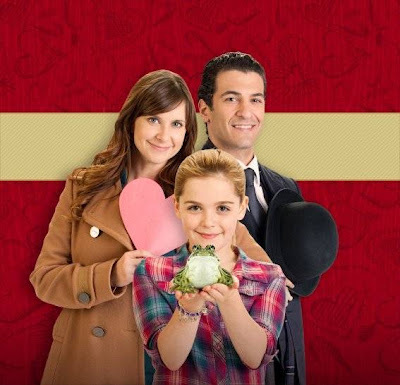 Hallmark Channel Movie, "Growing the Big One" Premieres this Weekend! According to the Hallmark Channel, Growing the Big One is the first movie airing to begin their Season of Holiday Movies! Yeah! I love Christmas, of course! In fact, that's why I first began this site! Growing the Big One Premieres - Saturday October 23, 2010! For more Movie Info and Pics, visit the Growing the Big One Page. CMA Country Christmas ... a Country Music Christmas Show!!! Country's biggest stars are joining together to celebrate the holidays! In true Christmas spirit, these artists will celebrate the season with songs and stories that are sure to warm your heart. They will also be joined by some of their family members. Sugarland's Jennifer Nettles will host "CMA Country Christmas". From what I have read, this should be a nice family show of Christmas Music & Entertainment!